The Challenge: Create a sanctuary for guests on a ranch property while being environmentally- conscious. 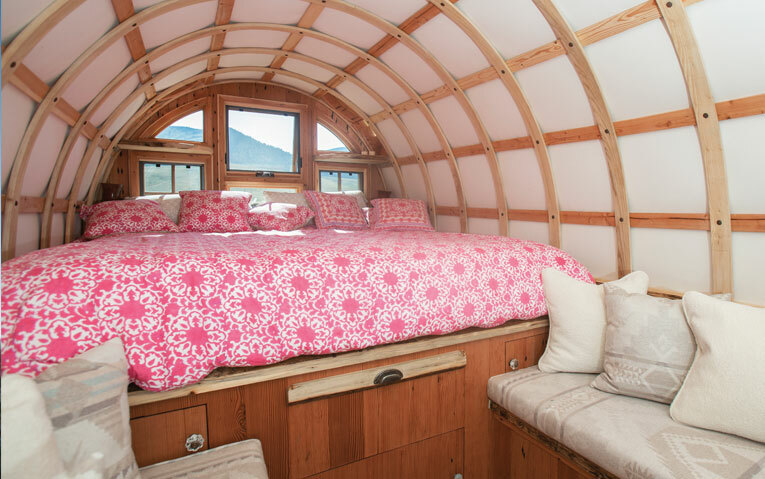 The approach: Reuse sheepherder wagons as guest quarters, trick out an Airstream, and build a minimal and mobile outdoor kitchen, again reusing materials. With the Trailing of the Sheep annual event going on in Sun Valley, Idaho, this fall, we can’t help it—sheep are on our minds. Legend has it that John Hailey, for whom the town south of Sun Valley is named, first brought sheep to the valley in the late 1860s. When mining dried up in the Sawtooth region, some resolute cattle and sheep ranchers stayed on to make permanent homes there. Development in the region was hindered until the Columbia and Beaver Company built “The Sawtooth Grade” toll road in 1881 at a cost of between $12,000 and $15,000. At that time, sheep and hogs were the least expensive animals to transport over the toll road at $.05 each, coming in just under “other animals.” Because sheep ranchers helped establish year-round communities on the north side of Galena, reclaiming old sheepherder wagons from disrepair and dressing them up to be welcoming and chic guest rooms adds to the visual narrative of this stunning property. Latham worked with the owner to ensure that the guests would have a sense of privacy but also have an inspiring place to gather. Latham says, “The aim was for a comfortable, attractive, welcoming place for guests to bunk while being environmentally-conscious.” One of the first events that the new owner of this ranch hosted post-remodel was her daughter’s wedding. The outdoor kitchen was central for that event, as were the guest wagons and the scenery. The design inside the wagons is light and airy, a choice that makes them feel more spacious and welcoming than a heavier, more weighted design would. Fabrics recall rustic with a modern twist and the color choices—used sparingly and intentionally—are vibrant but not overpowering. Some of the bench seats are covered in off-white and don’t demand attention. Rather, your eye naturally goes to either end of the wagon, the brightly-dressed beds, or the stunning natural world framed in the windows and doors. Then there’s the Airstream. A funky and fun addition to this rustic vignette, the Airstream, as all Airstreams should, transports guests to another world. The décor is a blend of the Idaho landscape (fur throw and the Navajo-inspired Pendleton blankets and a wool rug), the industrial (metal siding), and the far East (images of Buddha and purple- and orange-colored fabrics with faraway patterns).It’s a world unto itself—an acknowledgement of the simultaneous grounding nature of the experience on this ranch and the flights of fancy you can have when left to your own devices in the midst of such perfect beauty and harmony.